The oil light in your car. A screaming carbon monoxide detector. Syphilis. There are just some things you can’t ignore, hoping they’ll get better or go away — and you can add the narcissistic nuisance called Art Pawlowski to that list. 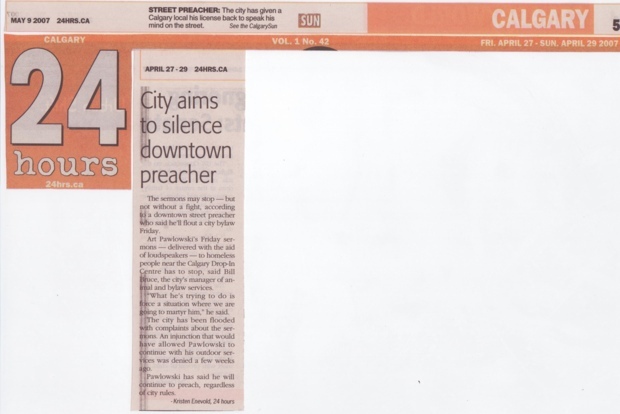 Calgary’s unfortunate cross to bear, street preacher Pawlowski has now shown those with the authority to stop him exactly what happens when you try to wish a problem away. You likely saw it too, if you were one of the 400,000 parade fans who took in the Calgary Stampede’s big 100th anniversary kick off last Friday morning. Just as official marshall Ian Tyson was set to get the annual procession rolling, Pawlowski and his band of insufferable sidekicks flooded the street, determined to hijack the Calgary Stampede parade. “He led the parade, essentially — it leaves a lot of questions to be asked,” said Ald. John Mar. Well known to police and bylaw, Pawlowski has made a career out of attention-seeking, ostensibly in the name of Christ. That includes city-hall preaching protests and screeching sidewalk sermons — and with more than 70 bylaw charges to his name, Pawlowski clearly loves the limelight of public confrontation. Here was a chance to preen in front of nearly half-a-million people, and the preacher couldn’t resist. Dressed in medieval garb and carrying shields spelling out the name of Jesus, Pawlowski and his zealots appeared out of nowhere, and then proceeded to march at the helm of the parade. No one stopped him, or even tried. Police everywhere, yet none attempted to keep the frothing friar from delaying, then stealing the show with his obnoxious holier-than-thou antics. “I’ve heard from constituents who are pretty grumpy that the parade could be disrupted like that,” said Ald. Diane Colley-Urquhart. Really, as parade hijacks go, it was a resounding success, helped hugely by the failure of anyone in authority to act. Other than a group of cops walking along keeping watch, Pawlowski was left alone. It was a bizarre sight to witness knights and ladies shouting “repent!” and other fire-and-brimstone slogans before a bewildered throng of Calgarians, tourists and cowboy-hatted children. “For the entire parade to be held up by this — this has gone way too far,” said Colley-Urquhart, who sits on both the Stampede board and the Calgary Police Commission. It’s that apparent scofflaw status that has Colley-Urquhart demanding an in-camera meeting Monday of city council and other relevant officials. 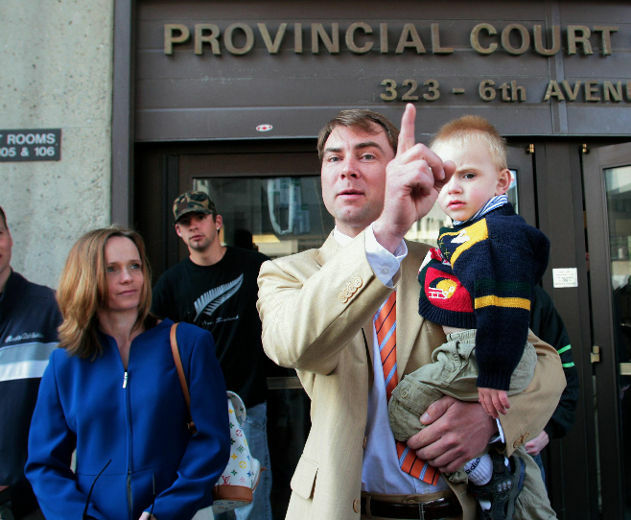 Whether bylaw and police officers are now over-cautious about dealing with the preacher, known for tantrums whenever handcuffs appear, will be made clear. Maybe police felt they had no choice, lest a riot start? Deputy Police Chief Trevor Daroux said the parade crashing incident is under investigation, but he is satisfied with the result of the non-confrontatial tact taken. “We’re just gratified this didn’t escalate into something bigger,” said Daroux. It’s true the Jerks for Jesus antics of the preacher and his flock failed to make the news, or appear on any television coverage of the parade. Still, there’s the question of precedent, and whether it’s possible now to stop other groups from hijacking future parades in the same fashion. Pawlowski and his crew at least face fines, having violated a parade disruption bylaw passed by city council last month in anticipation of this very event — Pawlowski having tried and failed before to take part. Bylaw boss Bill Bruce says he expects to be laying charges against the knights and ladies this week, but actually stopping Pawlowski was out of his department’s hands. “That’s a police decision,” said Bruce. It may be next July’s Stampede Parade before we learn if it was the right choice, or an open invitation. Now that you’ve read from Calgarys propaganda, here’s what really happened. Click on the picture below for complete information. ← We had an awesome time at the Prime Minister’s barbeque.